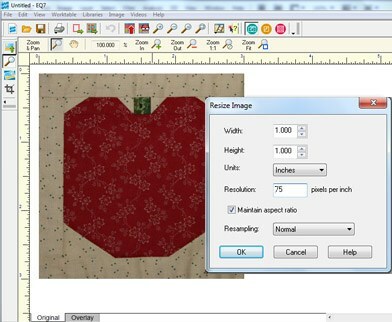 To create a block chart, you set up a quilt layout, scan each sewn block as it’s completed, import the scan into EQ7, and set it into your layout. It’s a great way to judge the progress of your quilt. You can even plan borders around these finished blocks. Create a folder for your block scans. Save each scan in your new Scanned Blocks folder. Get into EQ7 > on the Name a New Project tab type: Block Chart > click OK. This will be the name of the block chart project for your new quilt. Click WORKTABLE > Work on Quilt > QUILT > New Quilt > Horizontal. 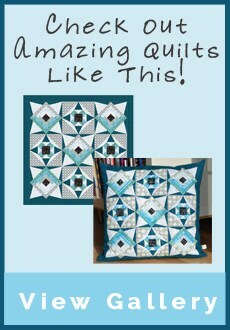 This lesson will assume blocks will be set side by side, as for a sampler quilt. You can choose a different setting style if you prefer. Click the Layout tab (screen bottom). Select the number of blocks Hor and Ver you’re planning, and the block size. Create a sashing size if you plan sashing. NOTE: This lesson assumes you’ll scan each block as you sew it. So all your scanned blocks will not be in the folder when you first work in this project. The next time you scan a block and add it to your Scanned Blocks folder, get into EQ7 > open your Block Chart project > and start from this point in the lesson. Click WORKTABLE > Work on Image. Click the Import Image button at left > a box appears > at the top of this box (Look in:) navigate to Desktop. Find the Scanned Blocks folder and open it to see your scanned blocks. Click a block > click Open. Your block scan will appear on the worktable. IMPORTANT: Since you’ll be importing LOTS of scans into this, it is imperative to resize scans to make each as small as possible. Large scans will bloat the file size, slowing up your computer. Remember, your block chart is only for planning purposes. So you need only a tiny thumbnail of each block. Click IMAGE > Image Resize. We’ll change this large scan to a tiny thumbnail. Leave anything else as is. Click OK > Click Add to Sketchbook to save it. You may think: BUT MY BLOCK LOOKS TINY! Don’t worry, tiny is perfect for the chart. Your scanned block image may look a bit fuzzy. Again, that’s ok, as it’s only for planning, and we want a small file size. Repeat ALL THESE STEPS with other scanned blocks: importing, resizing, adding to Sketchbook. Now to add scans to your layout, starting our chart. 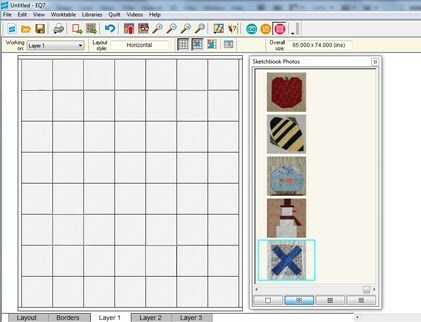 Click WORKTABLE > Work on Quilt > click Layer 1 (screen bottom). Click the Set Photo tool. Remember, your block scans are images (like photos) of the real blocks. Therefore they will be set as if they are photos, not blocks, using the SET PHOTO tool. 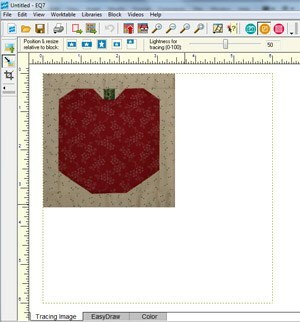 Click a block thumbnail > then click a blank space on your quilt layout to set the thumbnail into your layout chart. Repeat to add any other block thumbnails you’ve saved so far. 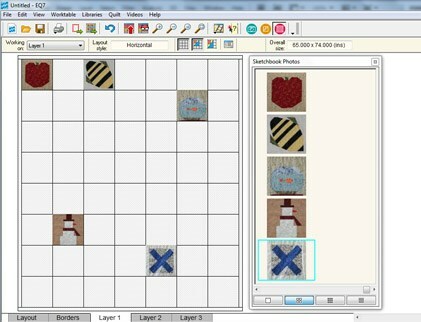 Use the Erase Block tool to erase any block on the quilt. Then use the Set Photo tool and re-set the block in a new place. Done for now? 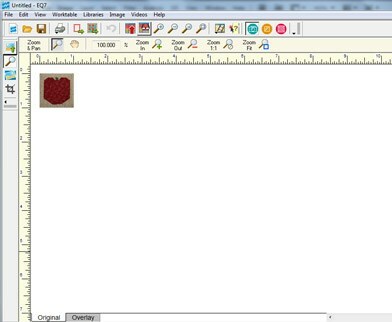 Click Add to Sketchbook to save the block chart with the blocks you have added thus far. keep track of which blocks you have sewn, adding new blocks as you complete them. 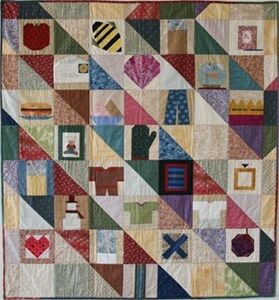 try out block placement ideas for your overall quilt if you wish. try out possible border ideas. Since this is a named project, everything you add to the Sketchbook will automatically be saved in the project file. You can exit when you’ve added any blocks you have to date. WHAT HAPPENS WHEN YOU FINISH SEWING YOUR NEW BLOCK? Open EQ7, open your Block Chart project > when it opens, go to the QUILTS section and edit your Block Chart quilt down to the worktable. Follow the steps above to import > resize your scan to a thumbnail > add it to the Sketchbook> then click the Set Photo tool and add your new scans to your Block Chart. Click Add to Sketchbook to save the block chart after each session of adding more blocks. Then you may want to View Sketchbook and delete earlier block chart (quilt) versions, leaving only the most recent.